Our AW18 ankle boots are now available on our online shop! With a wide range of different designs, in both suede, leather and velvet, we make sure you find a pair or two that your wardrobe has to own: A classic style for any everyday outfit or sophisticated work look. All perfect for the upcoming season! Ankle boots are a must-have and can be used in all seasons. They are therefore obligatory to have in the wardrobe and the boot always puts the finishing touch on any outfit. They can be used both with skirts, dresses, jeans and trousers and make your expression more stylish and mature, without being boring! Express your personal style with a pair of colorful - or glitter socks that give the last touch to your outfit. Create a sophisticated but comfortable look that goes with any type of outfit. In our New AW18 collection you will find a range of ankle boots with a minimalist design, characteristic details and top quality. With boots handmade in 100% suede and leather, we ensure that you get the best shoe experience and not least a boot that will last the next many seasons! We present a variety of styles, both our popular SHOE THE BEAR boots but with a new twist like Agnete, Ceci and Leila and brand new styles. 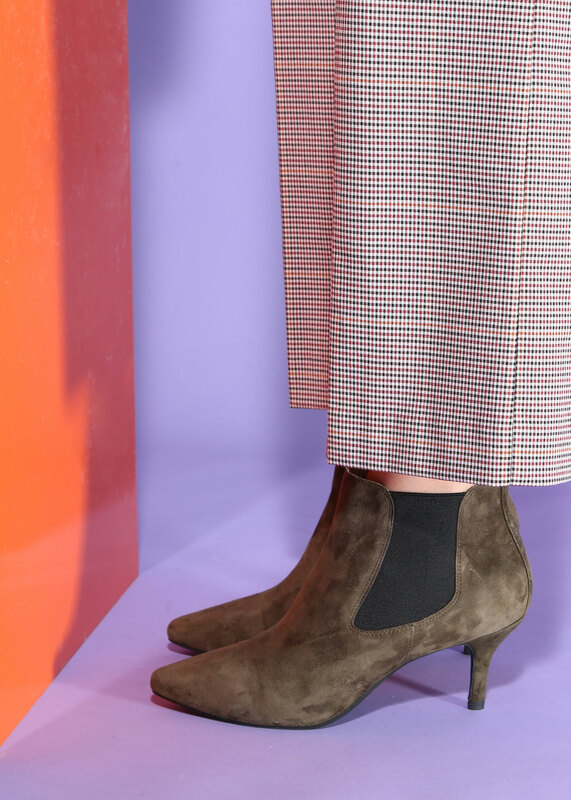 Find styles with or without heels, in suede or leather, chunky high heels or kitty heels - we have made it possible for you to find ankle boots for any occations and expression. Discover cool studs that give a unique and raw look but still suitable to be used for any occasion. For the first time, we present a range of boots in the material velor, which gives a feminine and elegant expression that can easily be matched with raw denim jeans or a stylish spring dress! Whether it's the elegant Agnete, Hannah or Ceci, the western inspired Leila - common to all the styles is that they will complement your own unique style. Our ankle boots collection are reflected and inspired by a variety of beautiful natural colors, in both brownish, greenish and gray shades, which can easily be mixed and matched with all outfits! The timeless classic black boot that fits perfectly with your everyday wardrobe, but also for a party, is of course also available among the many styles.